Despite widespread denial, the evidence that radio frequency (RF) radiation is harmful to life is already overwhelming. The accumulated clinical evidence of sick and injured human beings, experimental evidence of damage to DNA, cells and organ systems in a wide variety of plants and animals, and epidemiological evidence that the major diseases of modern civilization—cancer, heart disease and diabetes—are in large part caused by electromagnetic pollution, forms a literature base of well over 10,000 peer-reviewed studies. If the telecommunications industry’s plans for 5G come to fruition, no person, no animal, no bird, no insect and no plant on Earth will be able to avoid exposure, 24 hours a day, 365 days a year, to levels of RF radiation that are tens to hundreds of times greater than what exists today, without any possibility of escape anywhere on the planet. These 5G plans threaten to provoke serious, irreversible effects on humans and permanent damage to all of the Earth’s ecosystems. Immediate measures must be taken to protect humanity and the environment, in accordance with ethical imperatives and international agreements. In 1995, when cell phones were still luxury items, Sarah Benson from Australia contacted me to say that we had to organize internationally to prevent an electromagnetic assault on the Earth from the ground and from space. The following year, cell towers began to sprout like mushrooms over all natural landscapes. Wherever they sprouted, we received reports that bees disappeared, birds fell dead out of the sky, and frogs turned up with deformed legs, missing eyes, and other genetic mistakes in lakes, streams and forests. A few years later, 3,000 German doctors warned that the radiation from cell phones and cell towers was causing headaches, anxiety, insomnia, attention deficit disorder, extreme fluctuations in blood pressure, heart rhythm disorders, Alzheimer’s disease, epilepsy, cancer, and heart attacks and strokes among an increasingly younger population. The latest alarming study, released on October 15, 2018, shows a much more precipitous decline in insect populations than anyone had suspected—a 30- to 60-fold decrease in insects in Puerto Rican rainforests over the past few decades. Their study shows that insect populations did not decline during the 1990s until 1997, when they suddenly and precipitously dropped. That is the year cell towers were built everywhere in Puerto Rico. 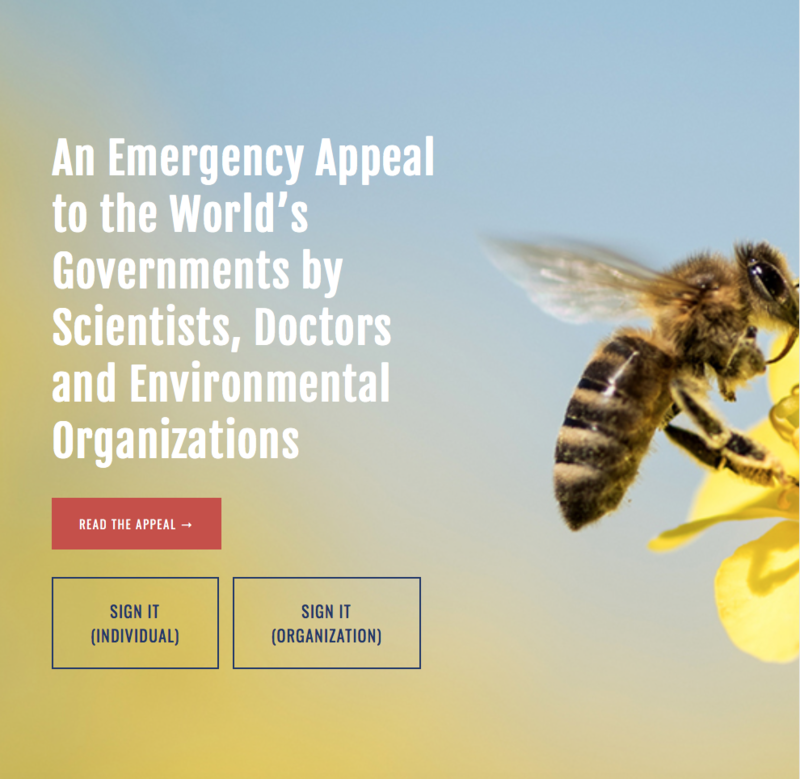 We originally envisioned this as an emergency appeal by scientists and doctors, which we planned to present to the world’s governments by November 1, 2018. But the outpouring of support and signatures from around the world, not only from doctors and scientists, but in far greater numbers from people who have been injured by their cell phones or by cell towers, and from the general public, has surprised and overwhelmed us. More than 300 environmental and health organizations and 11,000 individuals from all walks of life, from at least 95 countries, have signed so far. We are still processing the backlog of signatures, and we have posted as many of them as we can on the website (www.5gSpaceAppeal.org/signatories). In anticipation of asking everyone—not just scientists and doctors—to sign, we have now automated the process. So far, translations of the Appeal in eight languages (Chinese, Croatian, English, French, German, Greek, Russian and Spanish) have been posted on the website (www.5gSpaceAppeal.org/the-appeal) and at least 12 more (Arabic, Czech, Danish, Finnish, Hungarian, Italian, Japanese, Macedonian, Mongolian, Norwegian, Romanian and Serbian) will be posted soon. We are seeking volunteer translators for Farsi, Korean, Polish, Portuguese, Swedish, Turkish and other languages. We are just two people—a professional editor at the United Nations, now retired, and I—and we need your help in order to make this Appeal succeed. 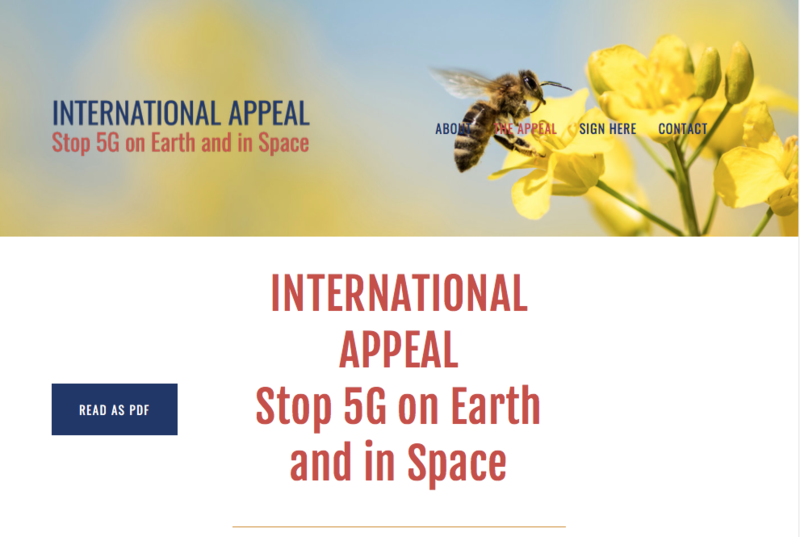 We are now asking everyone—not just scientists and doctors, but everyone—to sign the International Appeal to Stop 5G on Earth and in Space (www.5gSpaceAppeal.org/sign-individual and www.5gSpaceAppeal.org/sign-organization). Success is much more likely if the public is on board in large numbers. Over 20,000 US dollars has been spent on this Appeal to date, including website design and maintenance, data processing services, computer time, office supplies, paper, postage, international phone calls, professional translators for certain languages, a part-time assistant, and many other expenses. Until now this has been paid for entirely from sales of my book, The Invisible Rainbow: A History of Electricity and Life, which gives both the historical and scientific background of the present problem. Radio and television announcements, professional lobbyists, and other aspects of a public relations campaign will cost much more money than we presently have. Therefore we have recently added a “Donate” page to the website (www.5gSpaceAppeal.org/donate) and we are asking for donations in any amount. Another way to support the Appeal is to purchase my book, which is for sale on the Cellular Phone Task Force website (www.cellphonetaskforce.org/buy-the-Invisible-Rainbow). All the proceeds from sales of my book are being used to fund this Appeal. I keep none of this money and collect no salary for my work on the Appeal. We originally anticipated gathering signatures mostly from doctors and scientists, and presenting the Appeal ourselves to the United Nations, the World Health Organization, the European Union, and all of the 195 nations of the world. This would have had to be done by mail, email, and by finding appropriate people to present it around the world in person. But now we have a much bigger and more effective resource – YOU. You live in more than 90 countries around the world, and some of you are well connected, both with the public and with your government. My letter will ask the FCC to protect the world’s health and environment by CANCELLING THE AUCTION. There is already a report from The Hague, dated 2 November 2018, that hundreds of birds fell dead in Huijgens Park immediately after a new 5G mast (emitting 7.4 GHz) was tested on a nearby rooftop. Italy and South Korea have already held auctions of millimeter wave spectrum for 5G. Most of the rest of the world has not yet done this, and should not do this. Please, everyone send emails to the FCC Commissioners and the news media, directing them to our website and supporting our request that this auction be cancelled. PLEASE RECORD the names of the officials to whom you have presented the Appeal, and the date presented, and send me this information by email along with a copy of your cover letter.